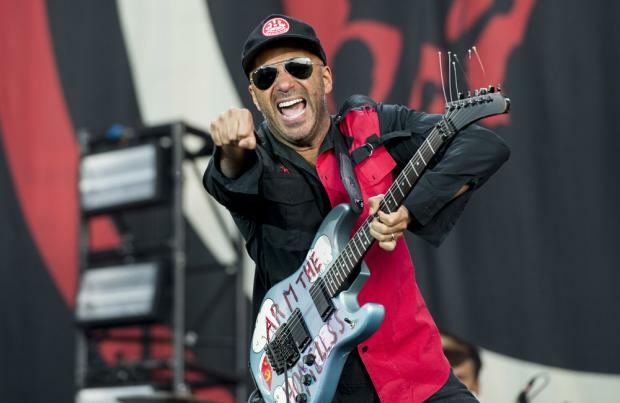 Tom Morello has praised Rage Against The Machine's fans for getting 'Killing In The Name' into the Christmas Number One spot. The fiery protest song hit the top of the festive charts in 2009 as a protest against TV talent show 'The X Factor' claiming the honour for a fifth successive year. Asked about the campaign as part of an online fan Q&A, Tom told The Guardian: "The Christmas No 1 was a spectacular example of People Power. "While the band had very little to do with the dethroning of Simon Cowell's 'X Factor' sugar-s**t, it was a movement of the fans that made it happen. "The subsequent free show that we performed at Finsbury Park was the single greatest night in the history of RATM and I will remember it forever." Speaking about the Christmas campaign at the time, music mogul Simon after 'X Factor' winner Joe McElderry was beaten to the top spot. He said: "I now realise I've taken too much for granted. I have got to hold my hands up. I accept there are people that don't like the X Factor." The track first peaked at Number 25 in the UK in 1993 - 16 years before the campaign - and Tom has dismissed the idea that the current generation of music fans are missing their own political anthem, and urged them to either look into underground bands or even form their own. He added in the live webchat: "Rather than lamenting that there's no 'Killing in the Name' or 'Smells Like Teen Spirit' at the top of the charts, either dig a little deeper, or better, form your own band and write your Killing in the Name. We'd love to hear it."